WASHINGTON LADY BLUE LIONS, 2018 DISTRICT RUNNERS-UP — The team on the court at Southeastern High School with their District runner-up trophy after a 57-44 loss to Sheridan Wednesday, Feb. 28, 2018. (front, l-r); Bre Taylor, Abby Tackage, Halli Wall, Maddy Garrison, Tabby Woods, Kassidy Hines; (back, l-r); Cloe Copas, Mallory Hicks, Hannah Haithcock, Maddy Jenkins, Shawna Conger, Rayana Burns, head coach Samantha Leach and assistant coach Mychal Turner. Not pictured, coach Corey Dye. Washington junior Hannah Haithcock puts up a shot on one of the rare occassions when she wasn’t double or triple teamed during the District championship game against Sheridan Wednesday, Feb. 28, 2018 at Southeastern High School. Haithcock was the game’s leading scorer with 22 points. Washington sophomore Rayana Burns drives to the basket during a Division II District championship game against Sheridan Wednesday, Feb. 28, 2018 at Southeastern High School. 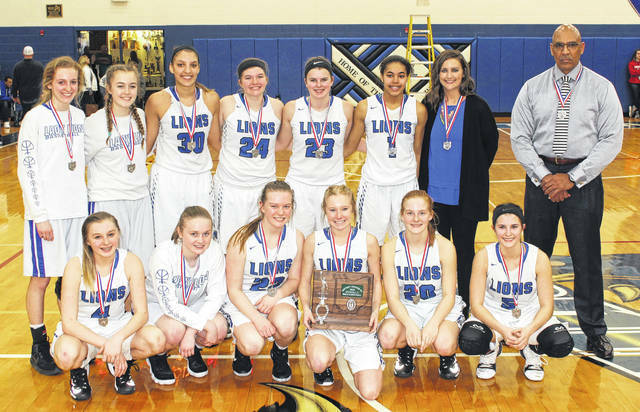 CHILLICOTHE — The Washington Lady Blue Lions put it all on the line Wednesday night in the Division II District championship game against the Sheridan Lady Generals. 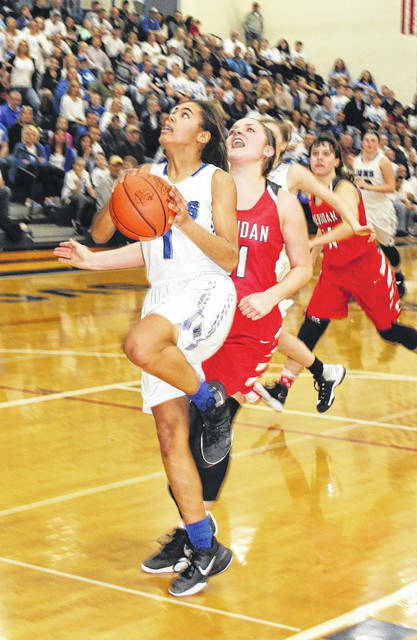 After a good start for the Lady Lions, Sheridan was able to outscore Washington in the second, third and fourth quarters to post a 57-44 victory. Sheridan (23-3) advances to the Regional tournament in Zanesville where they will play either Cambridge or Maysville Tuesday, March 6 at 6:15 p.m.
Washington ends a tremendous season with a record of 22-4. Sheridan plays a physical brand of basketball the likes of which the Lady Lions may not have faced during the season. In the end, free throw shooting was a key difference in the outcome. Washington made 14 two-point baskets to 12 for Sheridan. The Lady Lions hit three three-point field goals to four for the Generals. At the foul line, however, Washington was 7 of 14 for 50 percent. Sheridan made 21 of 24 from the line for 88 percent; a 14-point difference in a game decided by 13 points. Washington junior Hannah Haithcock was the game’s leading scorer with 22 points. Sophomore Rayana Burns scored 12 points, sophomore Shawna Conger scored eight points and junior Kassidy Hines scored two points. For Sheridan, juniors Rachel Cooke and Emma Conrad both scored 18 points. Cooke was 10 of 10 from the line and Conrad made 6 of 7 from the charity stripe. Sophomore Kendyl Mick had 17 points and seniors Jena Wharton and Sara Cooper each chipped in with two points. “This was not the outcome we wanted to see this evening,” Washington head coach Samantha Leach said. “I know they killed us on the boards. They did such a good job with offensive rebounds. We failed to make those box-outs, for whatever reason and get the defensive rebound when we needed it. “I thought our girls did a really great job of getting stops,” Leach said. “But then we were giving them second chance opportunities. Then we were having to work twice as hard to get another stop. Washington built a 9-4 lead with two minutes to play in the first quarter. Sheridan closed out the initial period by scoring eight points to three for Washington to tie the game, 12-12. Unfortunately for the Lady Lions, they would not enjoy another lead the remainder of the game. Washington thrice trailed by two points in the second quarter. At the end of the first half, Sheridan was in front, 26-22. Conger hit a three-point shot to sound a promising note at the start of the third quarter. That was as close as the Lady Lions could get in the second half. Sheridan made several baskets in the paint to open a lead of as many as 10 points in the third. The Generals led 40-32 after three quarters of action. Sheridan looked to pull away from Washington in the fourth quarter, going in front by as many as 16 points (49-33) with 3:37 to play. Washington went on a bit of a run with an old-fashioned three-point play by Haithcock, then a free throw from Burns and then another bucket from Haithcock that pulled the Lady Lions back within 10. The run continued with a three-point shot from Haithcock, sending a wave of hope and excitement through the large Washington crowd. The deficit for Washington was now seven points with two minutes remaining. After another pair of free throws by Sheridan, Burns scored what turned out to be the final basket of the season for Washington, again setting the difference at seven points. The Generals scored the last six points of the game for the final tally of 57-44. “I’m so impressed with the girls from last season to this season,” Leach said. “We’ve doubled our wins. Last year, we won 11; this year, we won 22 games. It just says so much about them individually, how committed they are to making people aware of Lady Lion Basketball again. They’ve put so much work into the season. Washington says thank you and good-bye to one senior: Maddy Garrison. “We will miss Maddy,” Leach said. “She’s really grown into a true leader this year. She works so hard, no matter how she’s feeling that day. She puts 110 percent into everything. She wins every sprint. She’s always going to give you everything she has. We just can’t say enough about her and we thank her for the commitment she’s made and all the years she’s put into the program. WASHINGTON — Rayana Burns 4-4-12; Maddy Garrison 0-0-0; Bre Taylor 0-0-0; Kassidy Hines 1-0-2; Tabby Woods 0-0-0; Halli Wall 0-0-0; Shawna Conger 1 (2)-0-8; Maddy Jenkins 0-0-0; Hannah Haithcock 8 (1)-3-22. TOTALS — 14 (3)-7-44. Free throw shooting: 7 of 14 for 50 percent. Three-point field goals: Conger, 2; Haithcock. Field goal shooting: 17 of 44 for 39 percent. Turnovers: 11. SHERIDAN — Aubrie White 0-0-0; Grace Conrad 0-0-0; Jena Wharton 0-2-2; Sara Cooper 1-0-2; Liberty Justice 0-0-0; Kendyl Mick 4 (2)-3-17; Mikayla Rhodes 0-0-0; Rachel Cooke 1 (2)-10-18; Emma Conrad 6-6-18; Claire Montgomery 0-0-0. TOTALS — 12 (4)-21-57. Free throw shooting: 21 of 24 for 88 percent. Three-point field goals: Mick, 2; Cooke, 2. Field goal shooting: 16 of 40 for 40 percent. Turnovers: 10. Thank you to Christina Taylor for providing the box scores for the Lady Lions games all season long.